I bought my iPhone 5 on September 28, 2012, after waiting in line almost 20 hours at the Apple Store in Roma Est. Four months into using the device every day, I think I can safely go ahead and share my thoughts. This is not a complete review of the iPhone 5. There were dozens of iPhone 5 reviews back in September, and hundreds after a few weeks of availability. This is my review of four months of usage in real life. The most visible changes in the iPhone 5’s design are the taller 4-inch screen and the lighter, thinner aluminum body. I like both. You’ve likely seen many tweets saying that “Wow, the iPhone 5 is light”. It truly is. I’d say that, after four months, the iPhone 5 still feels incredibly light: I can’t imagine how Apple could possibly make an even thinner and lighter iPhone, but it’s a fair assumption to believe they will. Unlike others, I don’t believe the lightness of the iPhone 5 makes it feel “flimsy” or “cheap”. The iPhone 5 looks and feels like a premium object worth owning and using. 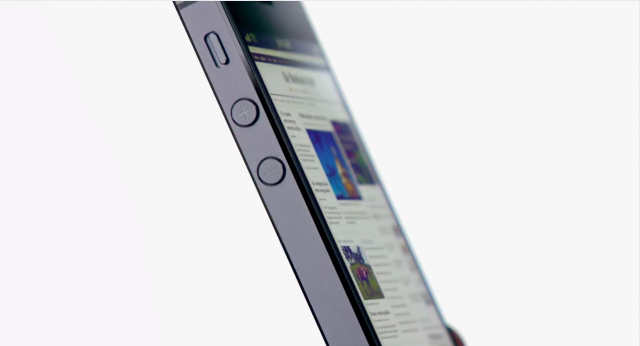 I was afraid the taller screen would make holding the iPhone 5 with one hand uncomfortable and stressing over time. Like Matthew Panzarino, I usually hold the bottom part of my iPhone with my pinkie and tap elements on screen with my thumb. Holding the iPhone with one hand is a big deal for me: for instance, in doing blood transfusions, I was often forced to use only one arm for eight hours straight, and back then I found the smaller screen of the iPhone 4S to be just right for prolonged use. Like Apple says, the iPhone 5’s screen still provides great reachability, but I’ve noticed I do indeed tend to rest my hand more regularly. I think the most stress is put on my wrist and thumb when trying to reach the “Back” button at the top of an app’s UI or when accessing Notification Center. It’s not uncomfortable, but I do rest my hand more often. I accept the compromise, because the taller screen lets me see more text at once. This has been particularly helpful when reading tweets in Tweetbot, text in Instapaper, or writing code in Pythonista. In fact, I think all those apps that employ an additional keyboard row to display extra keys highly benefit from the iPhone 5’s increased screen space. I happily accept a few minutes of “wrist rest” in return for a constant visualization of more information on screen. I’m not a fan of the iPhone 5’s camera. Or: the iPhone 5 takes great photos, but I don’t like how the software treats them in the Camera Roll. Because of the change to the 16:9 format, photos taken with the iPhone 5 display two black bars at the sides (landscape view) or top and bottom edges (portrait view). I understand Apple’s position: if iOS allowed you to shoot natively in 16:9, the black bars would have likely been displayed by other devices. As a user, though, I don’t like seeing photos inside a letterbox because most of my photo browsing is done primarily on iOS through Dropbox. Going forward, I hope Apple figures out a way to let users shoot and view photos in full-screen without seeing any black bar around a photo. As far as the camera itself is concerned, I’m impressed by the low-light shooting mode. To me, photo quality seems comparable to the iPhone 4S, but I despise the black bars. The iPhone 5 is fast. More RAM and a new processor mean – benchmarks I don’t care about aside – a faster experience for the end user. The Camera.app opens in less than a second and I’m still impressed by that. Browsers keep more open tabs in memory, and, generally, everything is more responsive and “speedy” than my old 4S. In the past four months, I have fallen in love with the new Lightning connector. Seriously, good riddance. For me, the best change is the fact that I can plug in my cable without caring about which side is up. It’s one of those minor, First World problems that add up over time and that has been fixed in favor of a superior, elegant design. I don’t use my iPhone 5 in the car with a Lightning cable, and I wasn’t using my iPhone 4S with 30-pin car adaptors before either, so I can’t say I have been affected by a “we need to change all our cables” controversy. I only use one cable, and I’m happy with it. I’m not always working at home, which means I use 3G a lot. I was quite happy with my iPhone 4S’ 3G speed, but the iPhone 5 is dramatically better. Allow me to explain: for some reason unbeknownst to yours truly, the Italian carrier TIM decided to deploy a DC-HSDPA network in the forgotten town of Viterbo (in Viterbo’s defense, even Apple got its map position wrong for over 50 days). After dozens of tests with the Speedtest.net app (which, by the way, still isn’t optimized for the iPhone 5) I have noticed I consistently average 12 Mbps in download and 4 Mbps in upload here in Viterbo. For context, my expensive, DSL connection at home averages 5 Mbps when it’s a good day and when Fastweb feels like pumping some data in those pipes. For me, having 3G that’s faster than Internet at home was an amazingly welcome change. I almost look forward to using the iPhone’s 3G connection now; that never happened before the iPhone 5. In fact, when my ISP had an outage last year, I used my iPhone 5 in Personal Hotspot mode, and I kind of wished the outage would last longer. iOS 6.1 brings support for LTE on TIM. With it, Viterbo is going back to its roots: I don’t think I’ll see LTE coverage here any time soon. The iPhone 5’s antenna improvements aren’t limited to Viterbo’s once-in-a-lifetime 3G performance. Because of an overall improved antenna design, the iPhone 5 usually gets 2 bars of 3G signal in places where the iPhone 4S used to fall back to EDGE. I am talking places like hospital corridors two floors underground where you wouldn’t think an iPhone could even get a signal at all. The iPhone 5 does, and it has allowed me – in actual, real-life life – to work where my iPhone 4S only let me play Ski Safari. I now see “No Service” far less frequently. I would say the new antenna guy at Apple is doing a good job. Unfortunately, there is a “but” in this antenna story. As I’ve tweeted recently, I have observed a “bug” that was introduced with iOS 6.0.1 and that hasn’t been fixed in iOS 6.0.2 throughout the latest iOS 6.1. That is, when I put my iPhone 5 in my pocket, it goes to EDGE. When I take it out, it doesn’t automatically switch to 3G – it’s stuck on EDGE, and I have to toggle Airplane Mode on/off to “get” 3G again. I never experienced this with the iPhone 4S. Now, I don’t think I have particularly deep pockets. I usually wear jeans and I’ve always kept my iPhone in my front pocket. With previous iPhones, it used to be that, in areas with 3G coverage, the iPhone would lose 1–2 bars or no bars at all when in my pocket; taking the iPhone out would restore those “lost bars” in a few seconds. With the iPhone 5 on TIM and since iOS 6.0.1, the device promptly goes to EDGE and never comes back unless I force Airplane Mode. I don’t know if this is Apple’s fault or a limitation of the TIM network after iOS 6.0.1, but I tend to believe it’s an issue on the software side. I am positive my pockets have nothing to do with it. I just know that it’s happening, that I can fix it by toggling Airplane Mode, and that it’s annoying. I look forward to iOS/antenna updates that will improve my pocket experience. Like others, I haven’t been exactly thrilled with battery life. I can’t go all day with a single 100% charge, so I started carrying a portable 7000 mAh external charger with me. I do believe, though, that battery usage is related to my iPhone using more power to find a cellular network for the aforementioned pocket condition. I would say that my iPhone 5 has slightly worse battery life than my old iPhone 4S. Yes, I have tried all the suggested “fixes” – I always start using a new device with a pristine version of iOS – and none of them worked. I like my external charger a lot. I’ve seen several people on Twitter complaining about the iPhone 5’s Power button. I had a similar experience with the button becoming unusable after 2 months; it was especially problematic for me because I take screenshots of apps on a daily basis and the button just wasn’t working. I got my iPhone 5 replaced at the Apple Store two weeks ago. After four months, I can say that the iPhone 5 is the best iPhone I’ve ever owned. Its design changes haven’t impacted my daily experience in a meaningful way, and the bigger screen lets me see more content with less interaction. The improvements made to the processor and antenna are, in my opinion, the best features of this update. The iPhone 5 isn’t perfect. iOS 6 is still a mixed bag, battery life isn’t great, and I have to toggle Airplane Mode to get my iPhone to remember 3G is available. I am looking forward to using an iPhone that Apple says will last two days, so maybe I’ll be able to get a full day out of its battery. The iPhone 5 has allowed me to work in more places with a faster 3G connection, and, ultimately, that’s what matters. I’m happy with my purchase.